Call Us For A FREE Office Cubicle Quote 713-412-3090. 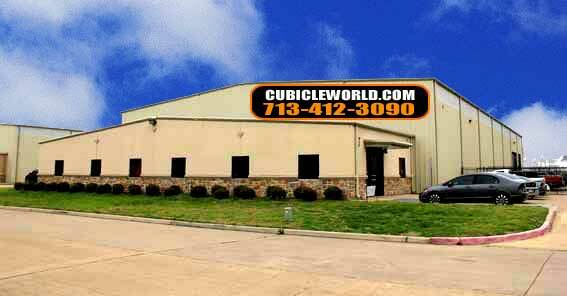 Can Cubicle World help our business grow? Yes, we certainly can. In fact, cubicle systems are often the best choice for new companies. In a lot of cases, we witness small companies experiencing a rapid growth spurt that forces them to quickly hire new people to handle the increase in sales. If these companies begin buying new furniture without professional space planning, they end up wasting some of the square footage they are paying top dollar to rent. We will prevent this waste by customizing cubicle systems to the task requirements of specific departments, top performers, and key executive staff. By comparing your square footage cost to your rental rate, we can build cubicle workstations that allow you to use the entirety of your office floor for sales, production, collaboration, efficient movement, support, storage, and operations. Can you furnish offices of all sizes and layouts? Yes. Cubicle World has sold workstations to businesses of all types and sizes ranging from the traditional to the highly specialized. We have built cubicle systems for reception areas, private offices, collaborative team areas, and sales and marketing staff. We have also built cubicles for highly specialized companies in financial services centers, customer support facilities, insurance companies, and a wide range of medical care centers. How many types of cubicles are there? Most mainline manufacturers produce one or more lines of cubicles. We can act as a sales channel for these entities if you have a specific preference for a particular brand or model. We can also design and manufacture cubicle systems in our own factory. Your telephones, documents, computers, and office supplies must be easy for you to access and use throughout the day without fatigue, discomfort, or frustration. The time spent at your workstation varies greatly according to your profession and specific job description. Your cubicle system will be designed to support everything you do on the job regardless of whether you are sitting, standing, or moving around the office to accomplish your task. When you divide your rent by the square footage in your office, you quickly realize the real cost of office furniture. Furniture that consumes square footage without supporting a specific task or system is limiting your return on office space. Consciously and carefully designed cubicles, on the other hand, actually help pay the rent by supporting the work flow systems that drive your revenue streams. You are more productive and work better with your coworkers if you are comfortable and energized throughout the day. Our cubicle systems are designed to eliminate the fatigue, aches, and pains that can slow down even the best top performers. Cubicles are nothing without the customers who use them. Meeting your expectations is the baseline of our quality assurance. Exceeding them is our highest goal. Can you stay within my budget? We most certainly can. If there is a cap on what you can spend on cubicle systems, we can look at used or refurbished cubicles as a cost cutting option. That way you can have the best design from a functional perspective without the higher cost of brand new equipment. That varies on your requirements and your location. We can deliver locally or out of state. We have our own fleet of trucks, and we are licensed by the DOT to operate nationwide. Are your cubicles used or new? We sell both. You can choose from used cubicles that are bought as is, or you can invest in refurbished cubicles that have been re-purposed to look new again. New cubicles from all the major manufacturers, including Herman Miller, can also be ordered through Cubicle World. Do you also do office moves? We specialize in office moves. That was one of the main motivators to invest in our own fleet of trucks. We can plan and execute your office move from start to finish, and we can scale the cost of labor and materials to fit your budget. We are fully insured on our end at 2 million dollars. We can offer additional insurance to you to protect your technology, furniture, office artwork, and office supplies if you want additional coverage on the move. We warranty our custom work for 1 year for workmanship and labor. New cubicles, however, carry manufacturers warranties for much longer periods of time. We will provide you with all warranty and maintenance details with your cubicle system quote. Yes. Ask one of our sales professionals about leasing options when you call us today. We also have cubicle buy back and liquidation programs that might be of benefit to you from an accounting perspective.